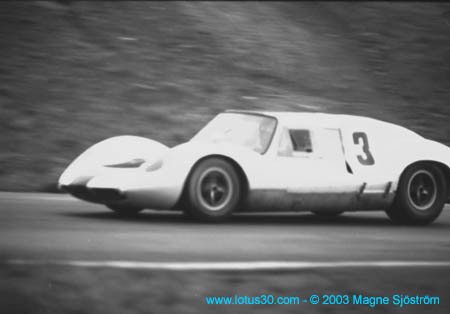 From 1965 and ’66 of this Lotus 30/40 was raced by the Willment team. Willment Years – Photo show Brian Muir, Frank Gardner, Bob Bondurant, and Willment Team manager Jeff Uren. 10 photos. In and About – Photos from trackside and in the pits. 9 photos. On Track – Photos of the car in action! 5 photos. Photos of the Pink Stamp Special since it arrived in Portland, OR USA 1978 to 1990. May-June 1979 – Disassembling the car. October 1979 – Steam Cleaning the chassis. March-May 1989 – In the body shop. Photos from British Field Meets and more. Current Photos – photos of the Pink Stamp Special 1990 to present. 2002 Portland Historic Races – Saturday/Sunday Qualifying sessions for the race. Brady Joy at the wheel. 38 photos. 2002 All British Field Meet / Lotus Club Track Day Sit in the Drivers Seat! – See a panoramic view from the drivers seat. Video Clips – Download video the Pink Stamp Special running. Hear the Engine! – What more need I say? Heine Lindeström has sent us some photos that his cousin Magne Sjöström took in 1967 of a Lotus 30 Coupe. The coupe is based on Lotus 30/L/16. Heine is currently working on tracking down more information on this car. Photos from the 2002 Goodwood Revival.